Baked, stuffed apples have likely been around for as long as there has been fire and apples. It’s said the Vikings ate them, and Medieval recipe collections contain plenty of examples. They appear in 18th century cookbooks under the name “Blackcaps”, likely due to their final appearance - blackened and looking like they’ve been beaten with a stick . But don't let their bad looks fool you. They are delicious! The concept is simple enough. Take some apples, remove the cores, stuff with filling, and bake until black. Easy peasy. It seems every cook had their own version of “stuffing”. 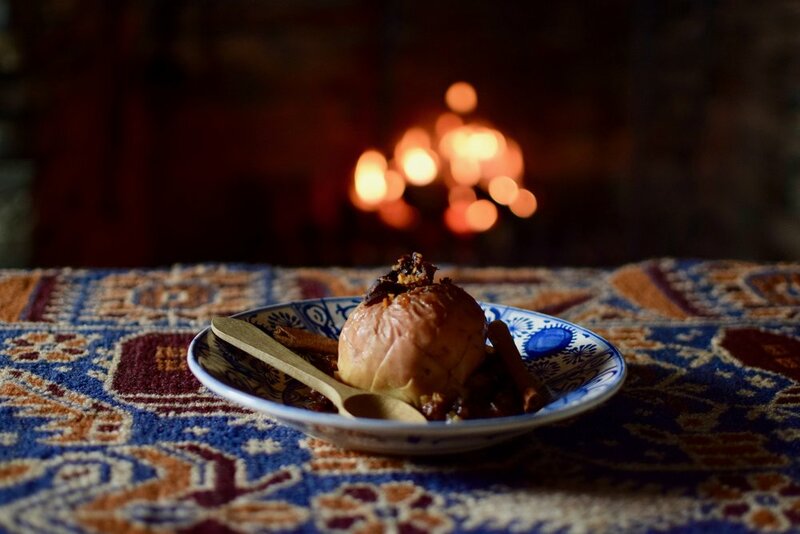 In the 17th century (when the Humoric Diet was all the rage) raw apples were believed to be cold and wet, and were therefore best cooked in wine and spices, which made them warmer. The stuffing recipe provided below reflects this belief, but feel free to make this dish your own. Put it in a paper, hard together and wet the paper as you do to roast wardens [a type of pear], and so lay it on a clean hearth and a good many charcoal upon it, and so let it burn as long as you perceive it to smoke, and when it leaves smoking, take it out. Eleanor seems like a resourceful woman and would have likely used tin foil if she had it, so feel free. There are also recipes in which the apples are half buried directly in the coals, without any wrapping at all! So that’s it .... core, stuff and bake until black. Have fun and don’t forget to post a pic of your blackcaps on the Colony of Avalon’s Facebook page for a chance to win this week’s prize - Nambe’s Meridian tea kettle in (what else) apple red - plus a chance to win this season’s grand prize. Good luck! Wash and core the apples, BUT don’t cut all the way through to the bottom. No need to get all fussy about this, but try to leave about a 1/2 inch of apple intact. An apple corer makes quick work of this task, but a knife and spoon will also work. With a knife, score the skin around the middle of each apple. This will prevent it from bursting during cooking. Mix the chopped fruit and nuts with the orange juice and rind. Pack the centre of each apple with this mixture. Place the apples in an oven proof dish (or on individual pieces of tin foil or wetted paper). Mix the brown sugar and the spice together and sprinkle over the top of each apple. Top with a knob of butter. Pour the sack/sherry/Madeira around the base of the apples. If you're using the fire baked method, sprinkle a little over and around each apple). If you’ve decided not to use the booze, sprinkle the same amount of water, or any liquid you like). If cooking in an oven or gas barbecue, bake at 350F for 45-60 minutes, occasionally basting with the liquid in the dish. If using an open fire or charcoal barbecue, wrap up your apples tightly and bury in the coals. Cooking time will vary with the heat of your fire, but check after 40 minutes. Regardless of your cooking method, your blackcaps are ready to eat when hot, blackened and soft. Here at the Colony’s 17th century kitchen, Lori and Krista have already cooked several batches of blackcaps. 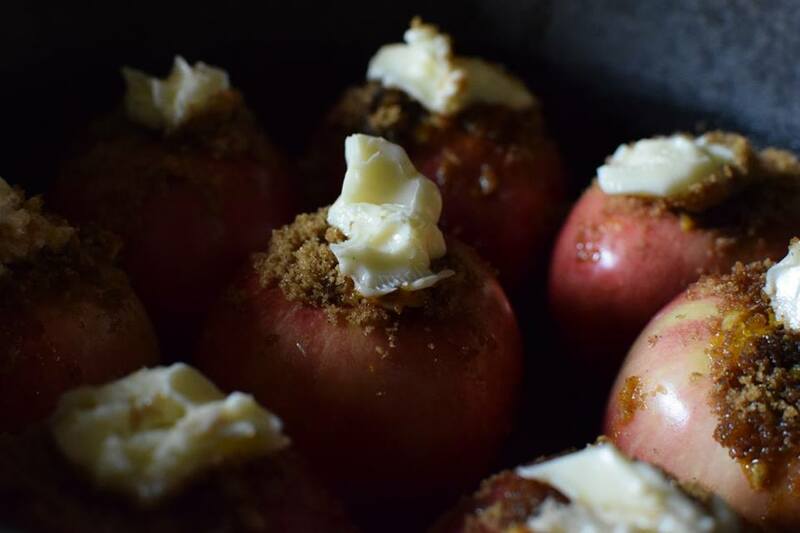 They (and our visitor-taste testers) suggest the baked apples are tasty, but need the addition of something cool and creamy on the side to really push this dish over the top (so much for Humoral theory!). Ice cream is the obvious 21st century choice, but Lori and Krista are going to give brandy butter a try. Lori has also experimented with both a meringue topped and a brandy-doused flaming version!